Video of the tragic incident can be viewed here. The video shows Medi initially standing in the water and after a couple of minutes a man, reported to be her handler, climbs onto her back and she lays down in the water on her side. The man plays around, jumping up onto her and standing on her but Medi can be seen flailing her legs and appearing to struggle to lift her head up above the water. Something is clearly wrong. After six minutes, the man finally realises the danger Medi is in and lifts her trunk above the water. Some twenty minutes later, a group of people enter the water and appear to be trying to move her but their efforts are in vain. She is finally winched out, her lifeless body, with eyes wide open on the water’s edge. 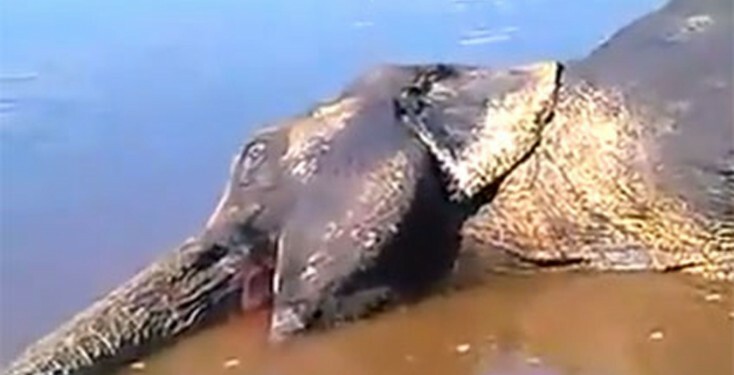 ADI understands that concerns about Medi’s wellbeing and health had previously been raised, with reports that her trunk was partially paralysed and she did not lay down to sleep, both of which may explain why she was unable to lift her trunk out of the water or right herself, as seen on the video. She should never have been allowed in the water, nor should her plight, and obvious distress, have been ignored for so long while she was in the water. We have been informed by our friends at the Estonian Society for the Protection of Animals (ESPA) that just a few weeks prior to Medi’s death, a number of eye witnesses had reported seeing the poor elephant being beaten. The group “In the Name of the Animals” held demonstrations outside the circus to protest. According to ESPA, the Food and Veterinary Office (FVO) looked into the matter but stated that they saw no signs of abuse. ESPA also informed us that the eye witnesses were not questioned by the FVO or the police. Medi was apparently born in the wild in 1965. According to ESPA it is prohibited under Estonia’s Animal Protection Act for wild animals to be used for public events. The circus should therefore not have been on tour with Medi and ESPA are pressing for legal action to be taken. ADI will be supporting the Estonian Society for the Protection of Animals and In the Name of the Animals’ campaign to win justice for Medi and to ensure an end to the use of animals in circuses in Estonia. The organisations have launched a joint, national petition calling for an end to the use of animals in circuses in Estonia. Just plain barbaric animal conditions are prevalent in circus environments and should be outlawed IMO.